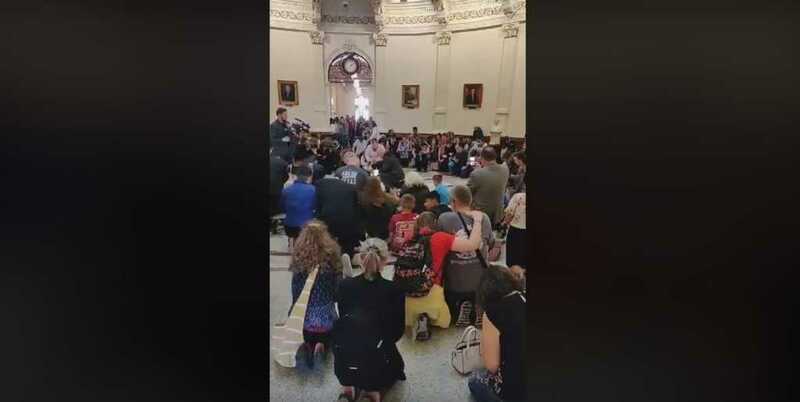 “Amazing Grace” and “A Mighty Fortress Is Our God” could be heard ringing out across the Texas Capitol Rotunda on Monday night as lawmakers heard details of a bill that would completely outlaw the practice of abortion. The video, posted by pro-life lobby group, “Abolish Abortion Texas” also showed a number of campaigners chanting “Equal protection for all” and “Abolish Abortion,” as the hearing went on. In addition to singing and chanting, one man, pro-life campaigner Rusty Thomas, also stood up and preached straight out of the Bible. Thomas is the father of the late Jeremiah Thomas, a 16-year-old whose dying wish to Governor Greg Abbott was to see abortion outlawed in his home state of Texas. “All things are possible,” Rusty declared, as he pleaded with God to end abortion in the state of Texas. Jeremiah’s younger sister, 11-year-old Jubilee, was one of several children to testify at the hearing. Some 350 people chose to testify in favor of the wide-ranging ban, which was brought to hearing by Plano Republican Rep. Jeff Leach.